There are a lot of opportunities to have your blood pressure checked: your doctor's office, of course; your local pharmacy; health fairs; and the dentist's office. The last one might surprise you, but blood pressure monitoring before a dental examination or office visit has become quite routine. Why all this attention to blood pressure? Because chronic high blood pressure (hypertension) is a major cause for cardiovascular disease (CVD), a family of life-threatening conditions that affects 80 million people in the United States. And, you may not even be aware you have it. That's why avenues for blood pressure screening are on the rise, and the dental office is a prime opportunity. Since you see us regularly for cleanings and checkups (you do, don't you? ), there's a good chance we might help you become aware you have a problem if we perform blood pressure readings. One study published by the Journal of the American Dental Association, for example, followed a group of dental patients with no previous risk factors of CVD, and who had not seen a doctor in the previous twelve months. Through blood pressure screening at their dental visits, 17% discovered they had high blood pressure and at risk for a cardiovascular event. Your blood pressure can also have an effect on your oral health, especially if you're taking medication to control it. Some medications can cause reduced saliva flow, which could drastically increase your chances of developing tooth decay or periodontal (gum) disease. We would also need to exercise care during dental procedures with certain local anesthetics: some may cause both your pulse and blood pressure to rise. Although we're primarily focused on your dental care, we also know it's only one aspect of your overall health. 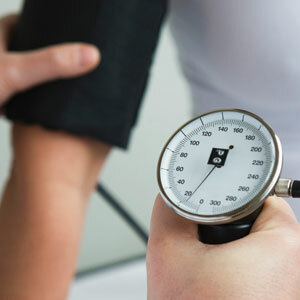 By simply including blood pressure checks during your checkup, we may help you identify a problem before it causes you greater health problems in the future. Should You Consider Dental Veneers? What Kind of Cosmetic Dentistry Can Help My Smile? Whatâ€™s the Best Way for My Family to See the Dentist? Can A Dental Crown Strengthen My Tooth? My Filling Cracked - What Do I Do Next? I've gotten my teeth whitened, now how do I protect my teeth?